An oxygen chamber of the kind used to help speed up England footballer Wayne Rooney's recovery from injury has been unveiled at a Swansea clinic. 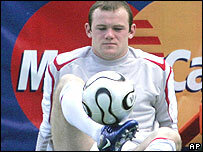 Rooney used oxygen therapy to try to help heal his broken foot ahead of England's World Cup campaign. Swansea City's Owain Tudur Jones is using the chamber after hearing it may halve his recovery time from surgery. Philip James, who opened the clinic, said the chamber healed injuries better than if patients breathed just air. Since breaking a bone in his foot in April, Rooney has spent time in an oxygen chamber to encourage the bone to heal more quickly. He will receive a further scan on Wednesday to help determine his level of involvement in the World Cup. Hyperbaric chambers are believed to aid recovery from injury by increasing the amount of oxygen in the body. Patients are sealed into a pressurised container, where they breathe 100% oxygen instead of the 21% oxygen found in normal air. The pressure in the chamber increases the amount of oxygen that dissolves in the bloodstream and the body's tissues. The dissolved oxygen reduces inflammation, speeding up the healing process. As well as sports injuries, the chambers are also used in the treatment of bone infections, gangrene, smoke inhalation, skin grafts, burns and crush injuries - and even in anti-ageing treatments. Professor Philip James, a hyperbaric medicine specialist, who opened the new O2 Therapy Centre in Swansea on Tuesday, said he wrote to Manchester United manager Sir Alex Ferguson in the wake of Rooney's injury to reassure him about the treatment. Prof James said: "I wrote to him because I think his fear was that Rooney may have a temporary quick fix and he might be well enough to play and then get injured - obviously then it might become a chronic injury. "But, in fact, all the evidence is that if you give hyperbaric therapy to a player with this kind of injury the tissue recovery is better than if you heal just breathing air." Swansea City midfielder Owain Tudur Jones has already tried the oxygen chamber to aid his own recovery from surgery after hearing it could potentially halve his recovery time. He said: "I don't want to miss too much of pre-season. That's when you lose your fitness and you are just playing catch-up with the rest of the lads which is not ideal. "To halve how long you're out for is unbelievable and if that ends up being the case then I'm sure any little niggle, I'll be in here every chance I get." "The tissue recovery is better than if you heal just breathing air"
What are oxygen chambers all about?